It’s easy to claim now, but for weeks I have been saying to anyone that will listen that Trump was a shoe in. As if to taunt myself I have had the above photo as my screensaver for a month now, which makes using the laptop before breakfast quite challenging. To me it was obvious. Yet, I wake to a world that is “ASTONISHED! !”, “IN SHOCK! !” and other emotions laid out in caps lock with accompanying exclamation marks. Why? Let me state my position clearly on Trump before I go any further – I hate Donald Trump both as a man and as a politician, BUT do I know why people voted for him? Yes, I do! And what’s more, we all did – we just pretended it wasn’t happening. I am frequently dumbfounded by very intelligent people who I follow, who are so often the champions of difference and diversity of opinions, astonished that not everyone shares their world view. People talk of a post-truth society, often citing Michael Gove’s dismissal of experts, but there is something deeper here. There is a whole political class that are living under the radar – or more worringly, feel they are. The same people that deride this notion, pundits in particular, are the very same people “ASTONISHED” when votes for people like Trump apparently appear from nowhere. Can no-one see the irony in a political system that dismisses the notion of a group of people voices not being heard, whilst simultaneously failing to hear those voices in all its polling exercises. If only we’d had a huge, unexpected referendum result a few months ago to act as a warning that people, rightly or wrongly, felt disenfranchised…..oh wait. Facebook and Social Media in general seem like the home for utterly pointless rage and anger – a relief valve. A place to briefly state how furious you are, without the laboriousness of having to do something about it. The fact that peoples dominant reaction is one of blind, impotent internet based rage, says to me all you need to know about why this issue isn’t going away. The internet, so often now, is a swamp of futile anger and more worryingly a place where you can ‘say your piece’ without having to act on it. The real issue for me is that, at a time when a donkey could stand as an anti-establishment figure and win, the political left (the home of the anti-establishment cause) is nowhere to be seen. If ever there was an opportunity missed, it is this. Perhaps this is really what the anger is all about – but the internet is not a place of self reflection. Instead, the world has Trump and the establishment is now the voice of the anti-establishment. Now, let me never stray in to politics again! Oh alright then, just once more but only to doff my cap to far greater political commentators than me….The Simpsons. This genius cartoon captured this situation beautifully in 1993. In an episode called Marge and the Monorail, the town of Springfield get a $3 million windfall. They meet to discuss how to spend it and reliable old do-gooder Marge wants it spent on Main Street, which has fallen in to disrepair, but her cries fall on deaf ears when a huckster businessman enthrals the audience at the meeting….watch for yourself. Now, back to death – but via Leonard Cohen. Every bit the lyrical equal of Dylan, sadly Cohen has joined the list of great artists we have lost in 2016. He was a master of misery and so it came as no surprise when I heard this beautiful letter he wrote to Marianne Ihler on her death bed, the eponymous subject of one of his most famous songs. Is there a simpler, more beautiful few lines about death than that? if so I haven’t read them. Leonard, I hope you are with the Sisters of Mercy now….you who’ve been travelling so long. Right….finally back to execution. I’ll be brief as I’ve blathered on. Last week I took another trip to Leicester, that seems to be a second home for me these days. En route I thought I would go via the Galleries of Justice at Nottingham. Eagle eyed readers of the blog might know why. For anyone who doesn’t, Nottingham played a vital role in the evolution of execution in Newcastle. Indeed, it was a crush in an execution crowd in 1844 in Nottingham that meant Mark Sherwood’s execution in Newcastle that same year was performed on the Town Moor – it was originally due to be the first to be enacted outside the walls of Carliol Square Gaol. As I have mentioned in previous blogs, in Newcastle there are very few symbols of execution still remaining. As such, imagining the scenes for a historian takes a serious leap of imagination – in Nottingham, this was far from the case. As I walked up High Pavement, to the Nottingham Galleries of Justice, I was struck by how the street felt so unchanged. On my right was the imposing St Mary’s Church, which has been standing – in part – since the c15th. High Pavement, Nottingham. St Mary’s Church is on the right of the picture and the Galleries of Justice are in the distance on the left. As I approached the Galleries of Justice, I felt like I could be in any period in the last two centuries. The only major sign of modernity was the Pitcher and Piano sign on the church to the right of the galleries. The Galleries of Justice, Nottingham. Formerly Shire Hall. The crowd crush itself, that led to the loss of many lives, actually took place on a steep little side street, named Garners Hill. 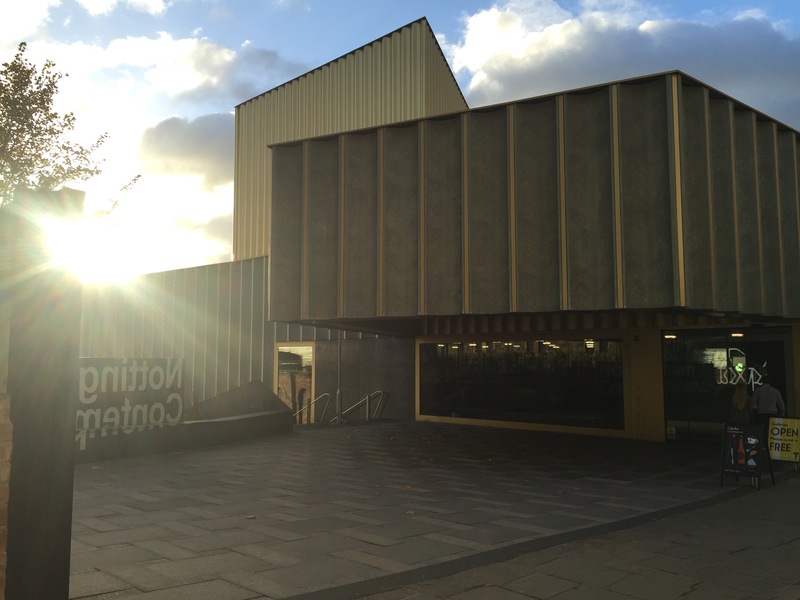 Today it is the home of the Nottingham Contemporary Arts Centre (a sign of progress for the gloomiest amongst us). The top of Garners Hill and the sunkissed Nottingham Contemporary Art Gallery. However, it was not the street I was in Nottingham to see. Instead it was something inside the galleries that had brought me on my detour – the gibbet of James Cook. Cook was the last man gibbeted in England and the subject of a blog a few weeks back. There is a replica gibbet in Leicester’s Guildhall, but the real one lives here and is as prominently displayed as it would’ve been hundreds of years ago. There’s progress for you! As I drove out of Nottingham I passed the City Ground, the home of Nottingham Forest Football Club. I had to stop. I was an obsessive Nottingham Forest fan for years, despite growing up in London in a family of die hard Gooners. As proof of my ardent support I even wrote to the manager with a new kit design and suggested transfer targets at the age of seven (“very good, but unfortunately we have already got one for this year…and I will look into those players.”) The pinnacle of my support came In 1997 when, at the ripe age of 13 and after years of applying, I was invited to be a ball boy. The day was a total disaster, Nottingham Forest got relegated, a guy in the crowd decided to shout “Oi, Twiggy” at me all day (we still don’t know why) and all the forest ballboys just wanted Tottenham Players autographs and not their own – I knew we were doomed. I think this was one of the major reasons I eventually succumbed to the family team, timed just perfectly to miss all of Arsenal’s major achievements, and mere weeks ago could be found at the Stadium of Light watching Arsenal thump Sunderland with my brother and sister. A very close friend of mine and one part of the comedy group I’m in has started his own blog. We frequently have political discussions at the brilliant Cumberland Arms over a few pints and I greatly respect his opinion on a lot of things (whilst not always agreeing with it). It also takes a scene from the brilliant One Flew Over the Cuckoo’s Nest for its title – what more do you want. Anyway, here it is. I have been lucky enough to be asked to give a post show talk at Newcastle’s Live Theatre for their latest play, Harriet Martineau Dreams of Dancing. The play details radical thinker Harriet Martineau’s time in Tynemouth. Set in 1844, it covers feminism, race, phrenology, mesmerism and much more beside. I saw the opening night production last night and found it a very enjoyable evening, the play had a comic quality and lightness of touch that made the central themes far more impressive on the viewers mind than a polemical approach would have been. I even got to meet @laurajwilkinson who has been a big supporter of my blog and constant aid with her legal expertise. Anyway, if you fancy putting a name to a face and enjoying a play then my talk is on Sunday 20th – don’t worry I have invited two actual experts to help me give the talk – I am merely the comic turn doing a bit on phrenology at the end. REM are currently releasing a 25th anniversary edition of Out of Time. Aside from the fact that it’s terrifying that that was released 25 years ago, it has meant I’ve started going over their back catalogue. I thought this song was pretty apt this morning, as I woke to hear the news from America. Sorry, Patrick, I’ve searched your blog but couldn’t actually find the political views you mentioned. Have I missed something ? I know this sounds facetious, but in fact your somewhat complacent and very generalised comments have surprised me. To resist the “post-truth” thrust requires an ongoing effort in vigilance. The invisible, invaluable work of resistance goes far beyond Facebook and the like and is, in part, being carried out at this very moment in the seminar rooms of our world by inspirational teachers seeking to enlarge their students’ knowledge, open their minds and help them aspire to freedom of thought. We can’t assume that what we read on Facebook is the whole story. That would be wholly simplistic and untrue. At the same time, a system that is not tuned for doing what I’ve just mentioned, doesn’t deserve to be called “education”. We have to go back to basics, remember what school is for, elevate the status of the teacher in society ( by paying a proper salary) and keep working towards an intellectual light for the good of society. Now that is a political view ! Oh, and please remove the photo of Donald Trump. His election is not a joke. Thanks for your comments and congratulations on skewering me so effectively; although I must say I have a few objections (only a few). As for removing the photo of Donald Trump though, I’m not a big one for taking things down and I also think that response goes back to the heart of what I was saying (or trying to) in my blog – there seems to be a general tendency to want to ignore/hide/wipe out things that we find objectionable. What purpose does that serve? to my mind the only thing that sort of attitude has led to is the state of affairs we find ourselves in now. Closing our eyes and putting our fingers in our ears when we hear or see something we dislike does not make it go away. Where I might agree with you is that using Trump for comic purposes is flawed as satire (although Brits so often claim otherwise) is exactly the sort of unhelpful relief valve I claimed social media to be. One only needs to see Have I Got News For You to realise that comic buffoonery is the start of many great political careers, as opposed to the end of them (as my friend Sean’s blog – which i plugged – expounds upon). Whether I have expressed a political opinion in this reply is still up for debate! Fair comment, Patrick, and thanks for replying. I’ve been suffering from SOHF this week, but it should go away if I keep taking the tablets. The problem with owning / displaying photos of demagogues is that it is an ambivalent act. I mean how can we distinguish between the ironic and the earnest intent ? I prefer to play safe by only posting pics of my nearest and dearest, although I did in all earnest keep a framed photo of a beautiful Jersey cow called Jenny on my bedside table throughout my childhood. It is still among my fondest never-to-be-thrown-away things. I suppose that would suggest ample food for mirthful interpretation ! Ah, I see that my Sense Of Humour is on the mend …..
Hi June. Thanks for the comments – it’s good to be challenged, woke me up from my usual Friday thesis brain stupor. I agree about the danger of ambivalence regarding images you post, but having re read my post I see that I went on to state quite clearly that I both vehemently disliked the man himself and his policies, which I think left little room for misinterpretation. As for photos of a cow – I have become the sort of person I used to hate, who endlessly posts photos of his dog on Instagram/Facebook and even have them round the house. To bastardise a Stewart Lee phrase, we all grow up to be the people we derided in our youth.